Great news for all Sooty fans (although let's face it, it was always Sweep that stole the show), the mute yellow bear often seen with either a magic wand or a water pistol will be back on our TV screens thanks to an increase in Sooty puppet sales. 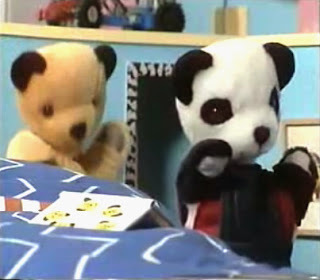 Richard Cadell, the successor to Harry Corbett and his son Matthew Corbett has acquired the rights to Sooty, Sweep and Sue in a deal that's believed to be worth around £1M. 80s kids may not know this but Richard Cadell presented the Sooty show for 10 years in the late 90s, early 00's. Following the sale of Sooty Richard Cadell has revealed that there will be some new projects on the cards for Sooty including a live tour and a new TV series. Although Sooty has been off our screens for a while now (apart from a few repeats on CITV)he has had a long and flourishing career that started way back in the 1950s. "I am delighted that Sooty is in, or should I say on, the right hands. Richard Cadell is as a close to a Corbett as you can get and we are very confident that he will give Sooty the love and attention that he deserves. "Having spoken to Richard about what he has planned for the future, I know he will ensure that Sooty will bring joy to the hearts and minds of a new generation of children, whilst creating nostalgia amongst those who remember Sooty so fondly." In our opinion it just wasn't the same ever since they introduced that attention seeker Little Cousin Scampi. It's the stuff of every 80s kids' dream - having the chance to own the authentic, head-turning KITT car from the TV series 'Knight Rider'. If you were on a search for a new car on eBay motors this week, however, you could have been in with a chance of snapping up one of the original cars from the third and fourth series of the show. With a reserve of $26,000.00 the 1984 Pontiac Trans Am black KITT car with an 8 cylinder, 5.0L engine and a mere 21102 miles on the clock had a total number of 27 bids. 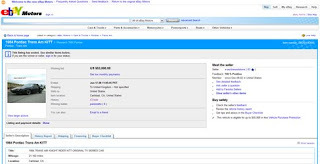 It eventually went for $53,000.00 yesterday from an unknown bidder going by the name of 'joerizzetto'. "This is one of the original vehicles from the series introduced initially in the third season and then re-converted to simulate the "Super Pursuit Mode" variant of KITT that debuted in the 4th season and was later used in the Knight Rider made for television movie (1984) and for exhibition and promotional purposes." Let's just hope that joerizzetto releases that the car doesn't come complete with William Daniels - the voice of KITT, unless of course he goes the whole hog and bids on a Knight Rider Car toy and keeps it in the glove compartment in the hope that it sets itself off every time he goes over a speed bump. · The Dubbing Cast Recreate a Scene Featurette. and ditch the SingStar (those Playstations are SO 2007), who needs them when you've got The Mysterious Cities Of Gold karaoke theme tune singalong. You'd need to put plenty of time aside to get through the outstanding 1120 minutes of this gem. 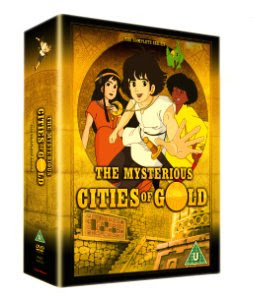 The Mysterious Cities Of Gold will be available from the 23rd June for £54.99. For more information visit www.fabulousfilms.co.uk.